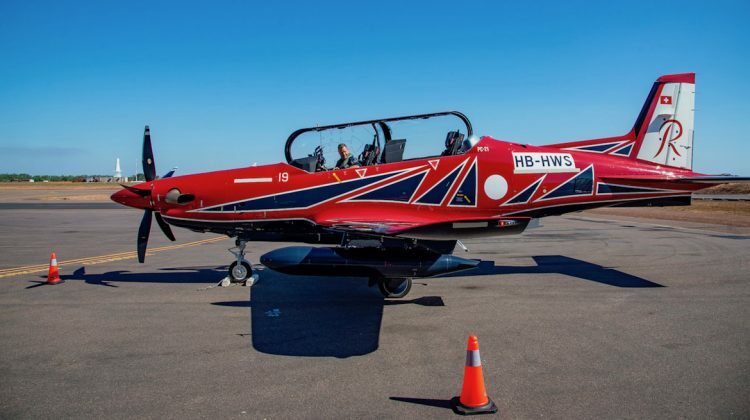 The first two aircraft for the Royal Australian Air Force’s (RAAF) acrobatic display team have arrived in Australia. The pair of Pilatus PC-21s, with registration HB-HWS and HB-HWT, landed in Darwin on Saturday July 21 from Kupang in Indonesia, as these photographs from Sid Mitchell showed. On Sunday, the PC-21s flew from Darwin to Adelaide via Alice Springs, according to flight tracking website FlightAware. The following day, the two aircraft reached RAAF Base East Sale. The Air Force Roulettes are replacing the Pilatus PC-9/A, which have been flown since 1989, with the PC-21s. The Australian Defence Force is acquiring 49 PC-21s as well as simulators and training devices under the AIR 5428 Pilot Training System. Under AIR 5428, the PC-21 will replace both the ageing Pilatus PC-9/A advanced trainer, which has been in service since 1988, and the CT-4B Airtrainer, which is currently used for basic training. 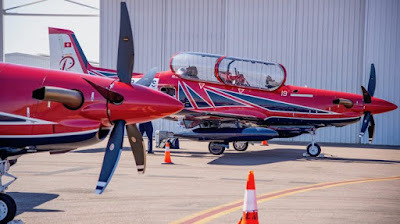 The PC-9/A is due to be withdrawn in 2019 after 30 years of service and more than 500,000 flying hours. AIR 5428 is an integrated system designed to train all future Royal Australian Air Force, Royal Australian Navy and Australian Army pilots. The project spans flight screening through all phases of pilot training from basic flying training at Central Flying School (CFS) at RAAF Base East Sale through to the advanced flying training at 2FTS (No 2 Flying Training School) at RAAF Base Pearce, north of Perth. Lockheed Martin is the prime contractor with responsibility for delivering AIR 5428 and is providing the ground-based training environment, with Pilatus providing the PC-21 aircraft and Hawker Pacific providing maintenance support. The first six PC-21s advanced trainers were formally welcomed into service at RAAF Base East Sale in August 2017. Ning mambu sengak..dadi ente kudu sedia masker utowo penjepit jemuran masbro😷..